Red Velvet is one of those festive, special tastes that works well for Valentine’s Day. Or it would be if you couldn’t get it everywhere these days. Nonetheless, I found this recipe at Sweet Pea’s Kitchen, and adapted it only slightly – it didn’t really need improving. 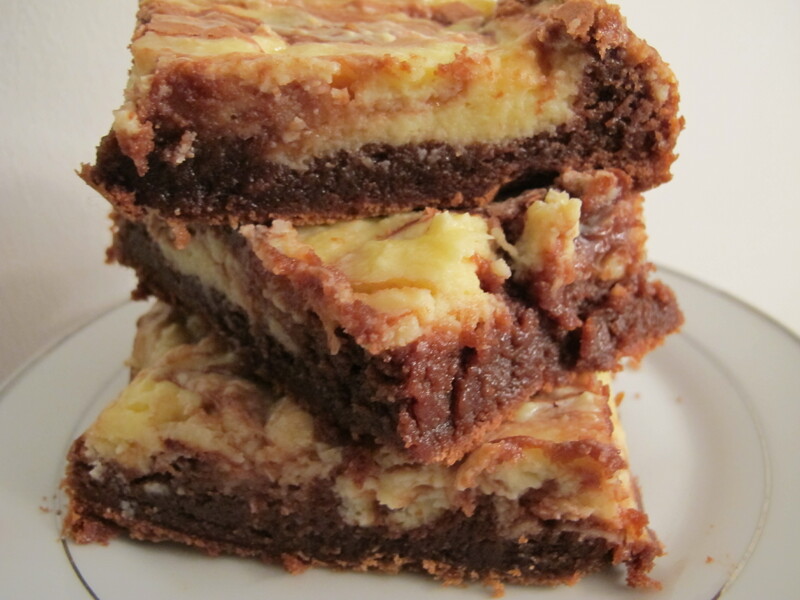 These aren’t particularly chocolate-y “brownies,” the emphasis is on the cheesecake and the “velvet.” And, they are cake-y rather than fudge-y, but they are fantastic. Preheat oven to 350. Liberally butter the bottom and sides of a 8 inch baking pan. Line with parchment paper if desired. In a small bowl, melt butter and chocolate together (can be done in the microwave). Stir until combined, cool for a few minutes. Whisk together sugar, eggs, vanilla and red food coloring. Add chocolate mixture and stir until smooth. Add flour and stir until just combined. Pour into prepared pan and spread into an even layer. To prepare cheesecake mixture, beat cream cheese, sugar, eggs and vanilla extract in a bowl until smooth. Distribute the cheesecake mixture in dollops over batter in the pan, swirl in with a knife or spatula. Bake for 35-40 minutes, until brownies and cheesecake are set. Let cool before cutting. Voila! Great post! and good blog..